Distinct Dental (Houston) - Book Appointment Online! Distinct Dental Houston is a family friendly cosmetic and general dentistry clinic located in the Houston Galleria area. 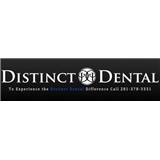 At Distinct Dental we offer the full range of dentistry services from routine cleanings to tooth whitening, sedation dentistry, dental implants, veneers, crowns, dentures, Invisalign, Emergency dentistry services and more. Distinct Dental Dentists are proud members of the American Dental Association, Texas Dental Association, and the Greater Houston Dental Society Distinct Dental Houston provides comprehensive dentistry services for the entire family. Our office is staffed with highly skilled and experienced Houston dentists and staff. We take pride in providing the utmost in excellent quality care to each and every one of our patients. We want our patients to feel like a member of The Distinct Dental Family. Great team, awesome doctor, I was referred to the office by a colleague who is also very please with his care from the office. I recommend this office to all my friends, family and my patients from the Emergency room.